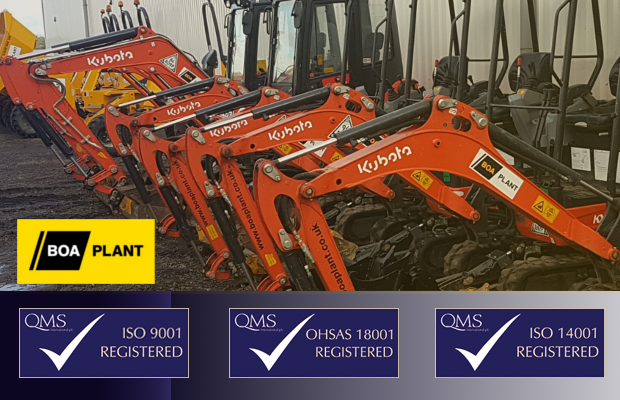 BOA Plant are fully committed to the health and safety of all its members of staff with the goal of ensuring that everybody is safe and well, in the work place and on site, at all times. This ethos is re-enforced by BOA Plant having its health and safety systems accredited to international standard OHSAS 18001 – Health & Safety. As a responsible company, BOA Plant are aware of its responsibility to maintain the environment and carry out business in the most sustainable way. Accreditation to international standard ISO 14001 – Environmental Management, demonstrates this on-going commitment. The result was certainly welcomed by Chris Stoneman, Finance Director of the BOA Group, who said "The procedures we have in place across all three standards help ensure that our business is running safely and efficiently, so to have it ratified externally that we are following these procedures is very reassuring to hear."